1985 Fisher Tourney Hawk This 1985 Fisher Tourney Hawk is powered by a 40H.P. Suzuki and is equipped with a Motorguide 46# Trolling Motor, Recessed Trolling Motor Pan, New Carpet, Single Axle Trailer with Spare Tire. For more detailed information, please contact Knox Marine. This boat has been garage kept and used little and less than 50 hours on motor. Runs perfect. Has working fish/ depth finders and fresh batteries for motor and trolling motor. Everything except batteries original and awesome shape. Original trailer included. 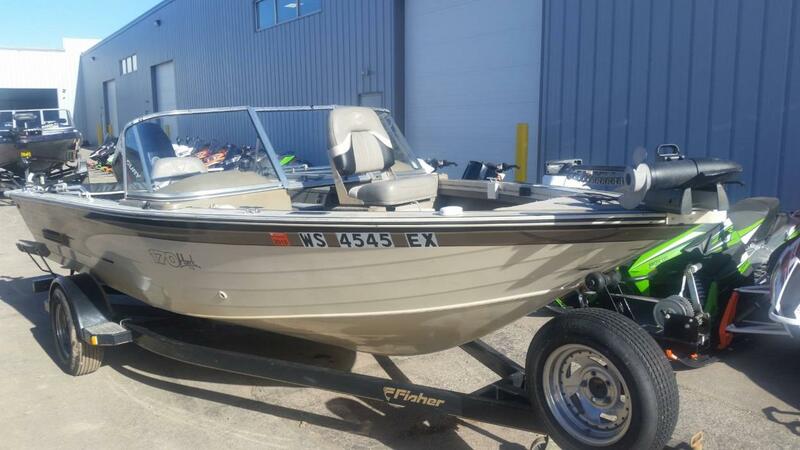 2000 Fisher 180 Marsh Hawk 2000 Fisher 180 Marsh Hawk with 90 hp Mercury and custom trailer! 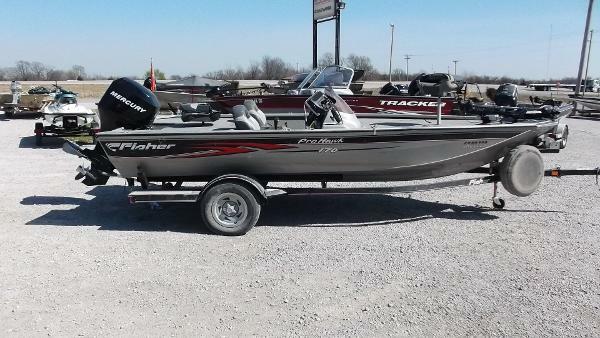 2005 Fisher Hawk 186 WT THE GREAT OUTDOORS MARINE - THE FUN STARTS HERE! 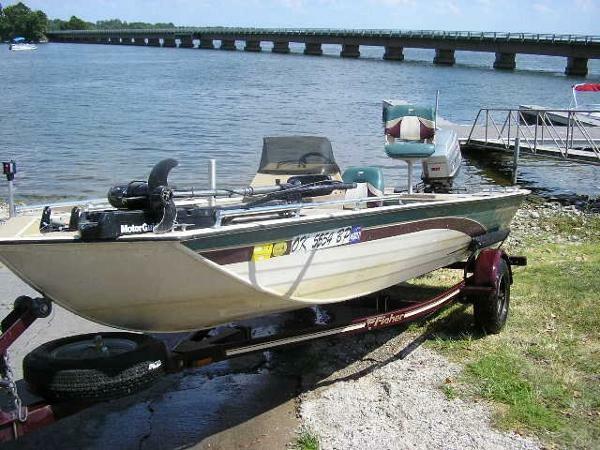 The 2005 Fisher Hawk 186 WT has a Mercury 90hp 4-stroke outboard and asingle axle trailer. The boat comes with a MinnKota Powerdrive 55# 12V foot-control trolling motor and an on-board battery charger. The boat has 3 livewells in it and a couple of fishing seats. The console is fully gauge-equipped (fuel, tachometer, speedometer and voltmeter.) Thereis also an Aquatronics CD player and a Lowrance HDS7. Pictures of actual boat to be added soon. 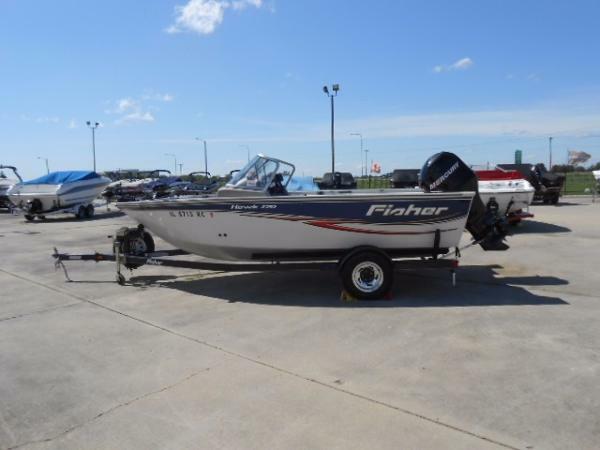 2005 Fisher Hawk 170 Sport Family-friendly and versatile, the Hawk 170 Sport combines full-on fishing performance with special features that make changing activities a snap. 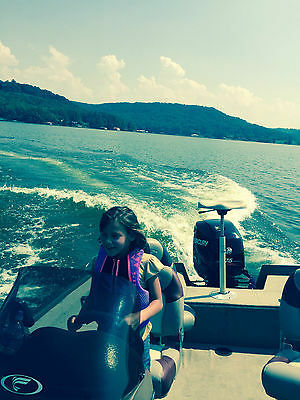 For fishing, there are timed, aerated livewells bow and aft, Lowrance fish finder, Minn Kota PowerDrive trolling motor and fishing chairs with multiple pedestal locations. 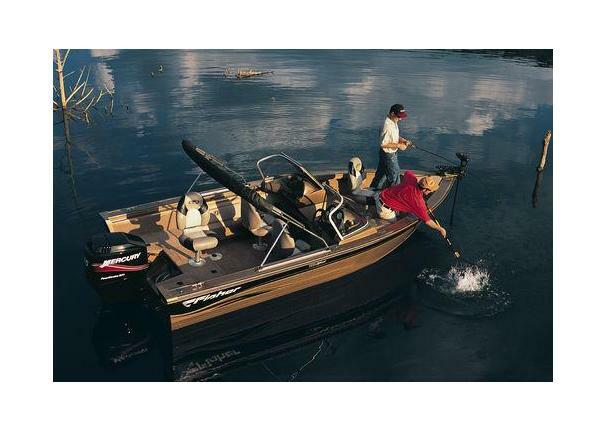 For other activities, the convertible bow area and fold-down rear bench seat transform the boat from fishing to a family runabout in seconds. The Hawk 170 Sport rides on a factory-matched trailer with GalvaShield protection. 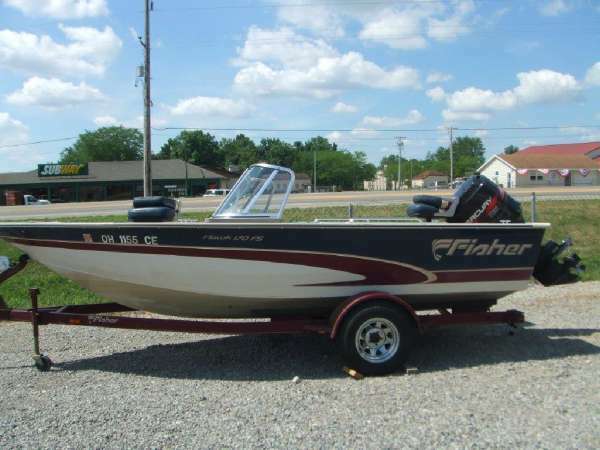 - Very clean, awesome fish n fun family boat!!! 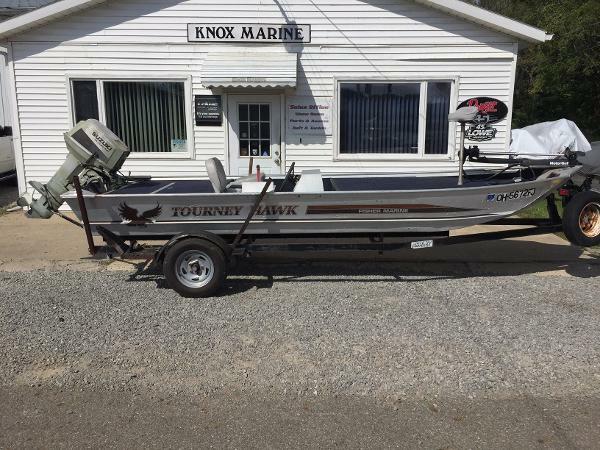 2000 Fisher Hawk 170 SC/FS THIS USED BOAT PACKAGE INCLUDES: 2000 FISHER HAWK 170 WT, MERCURY 115ELPTO 2STROKE, TRAILER H170 BUNK TRAILER, MINNKOTA TROLLING MOTOR, LOWRANCE LCX-15CI, BIMINI / SUN TOP, 4 SEATS, DEEP CYCLE AND STARTING BATTERIES. CALL MARINE SALES FOR YOUR BEST DEAL 920-788-0220. The wide-beam, wide bottom Fisher Hawk 170 SC-FS feature reverse chine Precision hulls and the Fisher Quad Performance strake system. With the Triangulated Keel Support system, the hull supports are connected by marine-grade aluminum plating which is foam-filled for added stiffness. The result is an incredibly stable and durable hull that runs smoother and drier. The 170 tracks straighter for a "glass" ride, even in the roughest conditions, and even deadens sound. The floors and decks are made of marine-grade aluminum, and the bow platforms are elevated for enhanced fishability. Other features include fiberglass reinforced consoles with storage shelves, aerated livewells - baitwells, in-floor storage, complete instrumentation, Lowrance X-38 fish - depth finders, enlarged bow and aft storage, improved driver's legroom, and more. Take the Hawk home on a matching trailer, fully loaded with an outboard motor support, load guides, and bearing protection. One owner my dad. 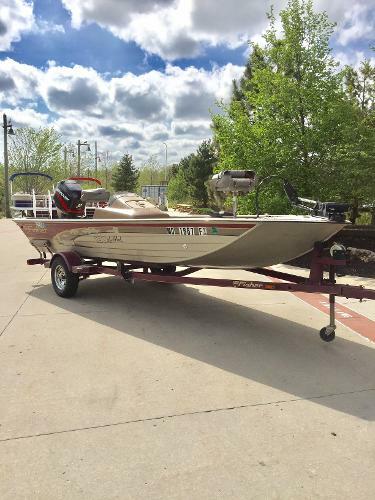 I am selling this for my dad as he has only used it once last year and twice the year before and because he keeps up the service, maintenance as well as winterizing every year it would be better for him to rent a boat when he needs it than to keep this boat. 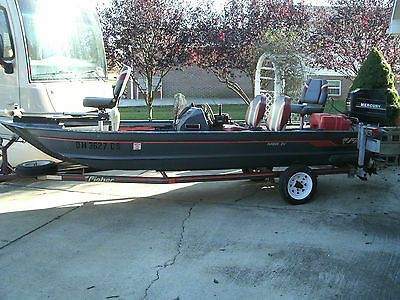 Selling the boat will also free up the third garage stall that was build just for this boat. ( I believe he is wanting to restore a classic car). Now about the boat. living in Ohio he has only used it in fresh water lakes and rivers never the great lakes though. The condition is very good he keeps everything he owns well maintained (habit from old Navy days). This boat has NO mechanical issues and the Service Center Forshey Marine Services 201 Colegate Dr, Marietta, OH 45750 Phone:(740) 374-4008 Has said if you have any question about the Boat please call as they have always serviced the boat here in Marietta. The model is a Hawk 3V Fisher A mercury Powerboat Division. length 15"7 Beam 62"bottom width 42"depth 24"Hull thickness .072"Boat weight (approx) 465 lbsMax boat capacity 4 people 830 lbsMercury outboard 40 Hp Oil injected this was an extra option very niceMotorguide electric trolling motor 12 volt BowDesign Features Controlled Vee hull Grey polyurethane tuff coat finish plush charcoal marine carpetFeatures and AccessoriesTwo pedestal mount fishing chairs 1 electric live well Rod savers Rod holders and storageTournament Trolling motor panelNavigation Lights Electric bilge pumpMarine batteryControl instrumentsMaster power switchSpeed/TachOther extras spare trailer tire kitNew wheels rims and bearingTwo new seats newer fuel tankIncludes trailer Now for the not nice statement i have never sold any motor item on ebay so i am following others a nonrefundable $500.00 deposit is required. within 24 hours the boat must be picked up by no later than march 1st if that helps. will help load if shipping at your cost and choice (dont have any experience shipping cars or boats so please have everything arranged before hand. finally please dont come and try to barter reduce the cost once you arrive as the price you purchase is the price it is. Thank you any questions at all please ask before purchase i will do my best to answer. 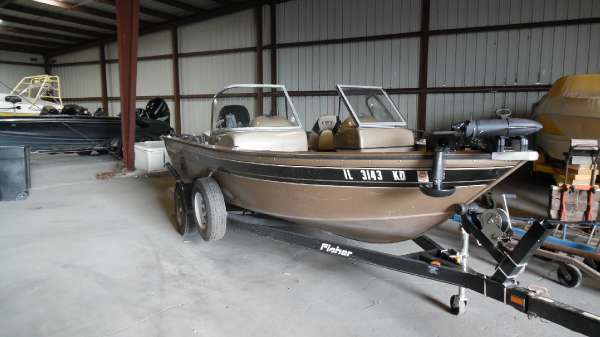 Fisher Pro Hawk 180- 18ft Bass Boat- 115 Mercury motor- Low hours- Loaded with cover- Aftermarket wheels with BFG's and SS prop- Great Shape- Also has pioneer cd player- Full financing professional nationwide shipping and extended warranties are all available on approved credit.